This is the total number of profanity incidents in this 601 page book. A masterpiece of Biblical scope, and the magnum opus of one of America’s most enduring authors In his journal, Nobel Prize winner John Steinbeck called East of Eden "the first book," and indeed it has the primordial power and simplicity of myth. Set in the rich farmland of California's Salinas Valley, this sprawling and often brutal novel follows the intertwined destinies of two families—the Trasks and the Hamiltons—whose generations helplessly reenact the fall of Adam and Eve and the poisonous rivalry of Cain and Abel. 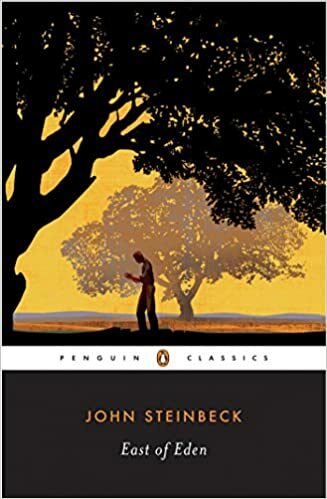 The masterpiece of Steinbeck’s later years, East of Eden is a work in which Steinbeck created his most mesmerizing characters and explored his most enduring themes: the mystery of identity, the inexplicability of love, and the murderous consequences of love's absence. Adapted for the 1955 film directed by Elia Kazan introducing James Dean and read by thousands as the book that brought Oprah’s Book Club back, East of Eden has remained vitally present in American culture for over half a century. This Penguin Classics edition features an introduction by David Wyatt. For more than seventy years, Penguin has been the leading publisher of classic literature in the English-speaking world. With more than 1,700 titles, Penguin Classics represents a global bookshelf of the best works throughout history and across genres and disciplines. Readers trust the series to provide authoritative texts enhanced by introductions and notes by distinguished scholars and contemporary authors, as well as up-to-date translations by award-winning translators.